The Mirror class rules, specify that fittings are optional, but with a list of restrictions (e.g. limit on purchase of the kicking strap, limit on the number of mainsheet blocks,....). 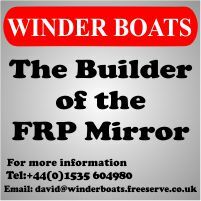 So a varitey of ways of fitting out the boat have developed over the years. 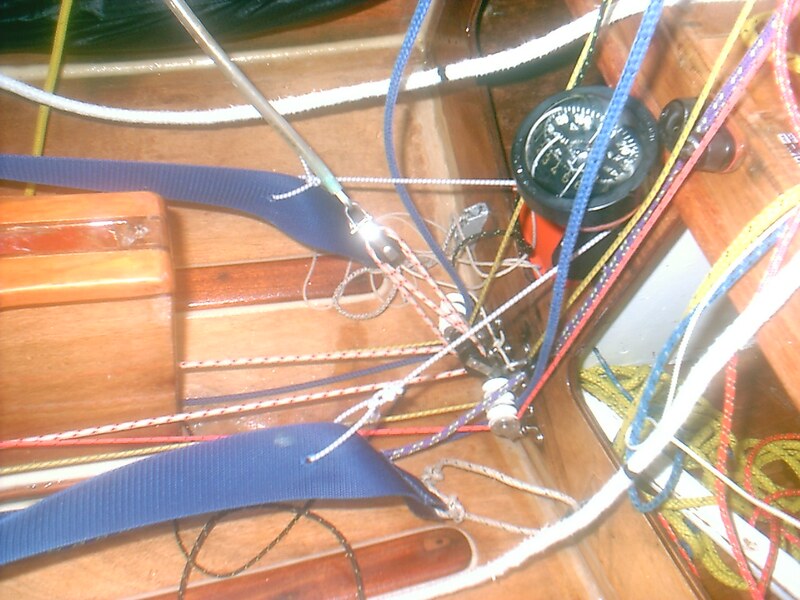 Since the advent of modern 'low stretch ropes' (remember, prior to this ropes used to be stretchy), one of the most popular on a racing boat, is to have control lines (in general it's the mainsail controls - kicking strap, tack downhaul, crew outhaul) led back to the thwart area with cleats mounted on the aft edge of the thwart, and duplicated on each side. This allows adjustments to be easily made by helm or crew while sailing the boat without having to change position. It's also normal to have the cleat for the spinnaker halyard back by the thwart so the helm can hoist or lower the spinnaker while the crew is dealing with the pole. Some users of the flyaway pole system have the pole deployment line led aft (but not duplicated) as envisaged in the flyaway pole article by Stephen Heppell. I like to have my spinnaker pole lift lead back. It's generally only in light winds when this needs adjusting, so, in my view, there is no need to duplicate it on both sides. To lead back three control lines, and duplicate them, requires two triple blocks on the stowage bulkhead, two triple blocks low down on the aft edge of the thwart and six cam cleats with fairleads. A Harken triple air block is almost £40 (in 2018), Harken small cam cleats are almost £25 each, so this all adds up to a lot of money. You might be able to save a bit by using a different manufacturer, or not using ball bearing blocks. 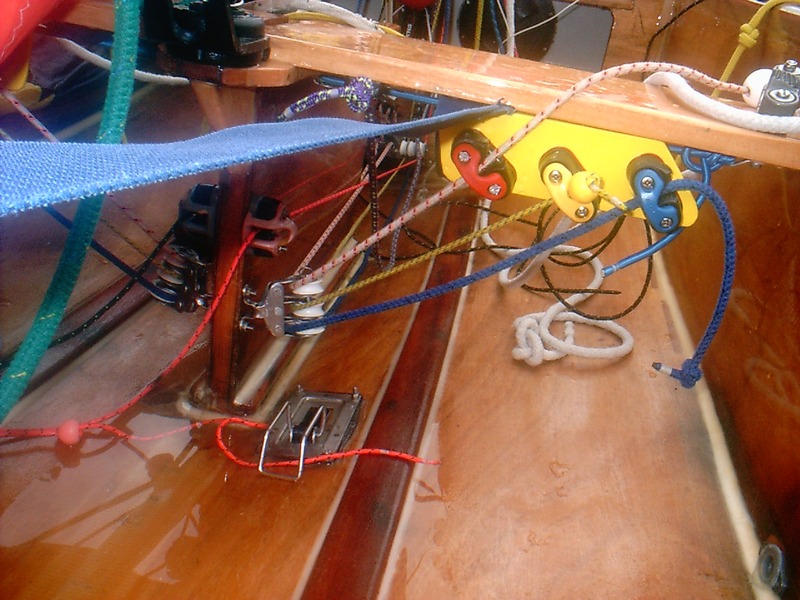 In the photo above, the triple blocks (white sheaves) are mounted on deck clips which are bolted (Celia's Law) through the stowage bulkhead with wooden backing blocks and oversize washers. The triple blocks near the back edge of the daggerboard case are also mounted on deck clips. On a wooden boat you can mount them on the batten which runs down the aft edge of the daggerboard case. It the photo above, the starboard side triple block share bolts with the triple block on the port side. On reflection, I could probably have mounted those a bit lower. On the Trident-UK FRP boat, the back edge of the case is too thin to mount anything on, you will need to glue some sort of block onto the floor just aft of the daggerboard case. 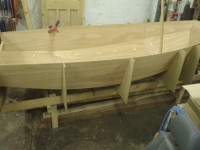 On the Winder, a small moulded block is added at the aft end of the daggerboard case to take the fixings. In the photo above, the cleats are mounted on a piece of 'L' section 2mm aluminium painted yellow, which is bolted to the thwart with four bolts. Duffins tend to have wooden blocks glued under the thwart to provide a mounting surface for the cleats. On the Winder, the thwart is very deep with a web, so cleats can be mounted directly onto the aft edge of the thwart.